Our petition requesting bike lanes on Tower Grove Avenue has received over 640+ signatures and local TV coverage. More than 230 people shared their thoughts on why a safe Tower Grove Avenue is important to them, and the comments make for compelling reading (see below). Update: Alderman Conway opposes City proposal for Tower Grove Avenue. We shared the petition signatures and comments, together with the conclusions from a recent SafeTGA meeting, with Alderman Conway, who represents many of the petition signers. Here’s what we learned. Alderman Conway does not support installing buffered bike lanes before Kingshighway closes, but he will oppose the City proposal to paint a “bikeable shoulder”, which at the meeting was widely regarded as unsafe. Instead, he supports making no changes to the roadway striping on Tower Grove Avenue during the Kingshighway closure (“Alternative 1” in the meeting report). Like in the City proposal, “no parking” restrictions will be imposed on Tower Grove Avenue during rush hours (7-9am northbound, 4-6pm southbound). Importantly, “bikeable shoulder” lanes in the City proposal will not be painted. Also, signage indicating bicycle detours will be installed. We appreciate Alderman Conway’s position, which addresses a significant concern we had with the City proposal. Nevertheless, both Alderman Conway’s and the City proposals will put two lanes of traffic during rush hour on Tower Grove Avenue, and encourage driving in the right lane whenever parked cars permit. As we explained elsewhere, this will create real hazards for riders, and will effectively dissuade people from riding what today is the busiest cycling route in St. Louis. Rather than using the closure of Kingshighway as an opportunity to promote alternative transit, the City is poised to take steps which will discourage alternative transportation. As of early December 640 people signed the petition asking for buffered bike lanes on Tower Grove Avenue before Kingshighway closes, and 230 of them left comments. Here is where they live and what they have to say. Petition signatures per zip code as of 12/2/14. 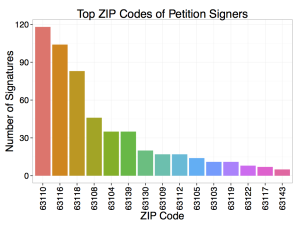 Of the 640 signatures, half of the signatures came from zip codes 63110, 63116, and 63118 (Shaw and Forest Park SE, Tower Grove South, and Tower Grove East, respectively – see here for a detailed map of zip code areas.) These are the three zip codes closest to Tower Grove Avenue. Clearly, it is the St. Louis locals who care about safe cycling and good infrastructure. The pedestrian accessibility that currently exists is wonderful on TGA, bravo to those who worked so hard to have that in place! Why on earth would you want to take that away and replace them with angry drivers who generally have no need to be there, except for you placing them there with detour signs!? 1 Pings/Trackbacks for "Petition Update"